The Islanders are 3-1, Does This Mean They’re Good? 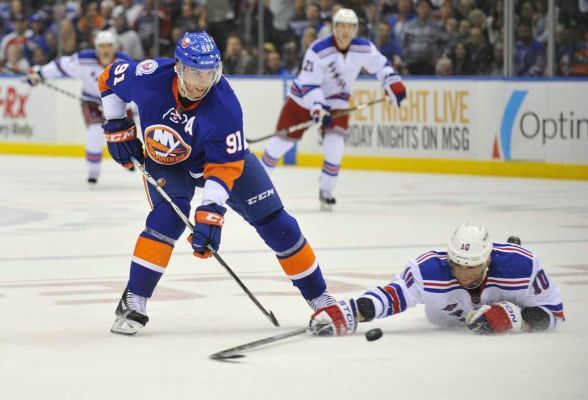 Is this the year John Tavares Becomes an NHL Superstar? So the Islanders have won three of their first four games. Am I excited? Absolutely. But I’m not going to make the same mistake I made last year when I got a little pumped too early (after I posted that article, the Islanders lost their next 14 games). But I have to admit, this team is playing well. John Tavares is starting to look like a young Steve Yzerman, while his supporting cast has been outstanding. Matty Moulson and Michael Grabner have started where they left off at the end of last season. Plus, Al Montoya and Evgeni Nabokov have been impressive in net so far. Even in the shutout loss against the Panthers, Montoya was solid after a rough first period. Nabokov looks great in his Islanders debut against the Rangers on Saturday. With DiPietro hurt (shocker), I’m hoping this goaltending consistency continues into this upcoming road trip. Overall, I am not surprised by the Islanders fast start. Unlike the rest of the hockey world who still thinks the Isles are a joke, I believed they would start hot. Maybe this is the year this young team can put together a strong season? Maybe John Tavares is going to have his breakout year? It certainly looks like that so far. But let’s not get ahead of ourselves. The Islanders being 3-1 only means they’re 3-1, nothing else. Still 78 more games to go. The Islanders take on the Lightning in Tampa Bay on Thursday night. This entry was posted on October 17, 2011 at 11:22 pm and is filed under Islanders. You can follow any responses to this entry through the RSS 2.0 feed. You can leave a response, or trackback from your own site. Time will tell. I’ll be out at the Coliseum on November 5. Let’s see how they play over the next 20 games.